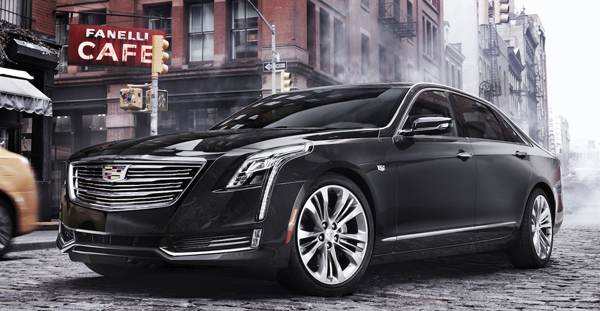 CADILLAC’S CT6 — TOP OF THE LINE by Jim Corbran, Automotive Columnist Cadillac, a name long associated with gigantic luxury barges which appealed to many the pensioned driver, a decade or so ago began changing its image. When its mid-sized CTS sedans hit the market for model year 2003, automotive journalists stood up and took notice. Handling and crisp lines were now near the top of the list of goodies offered on — egads! — a Cadillac! The competition switched from Lincolns and big Chryslers to BMWs, Mercedes-Benzes, and Audis. As the years went on the CTS showed up on Car and Driver’s “10 Best List” and was named Motor Trend’s “Car of the Year.” Subsequent years saw more improvements to the CTS, and eventually the introduction of a smaller ATS built on much the same idea. Turn the calendar ahead to 2016, with Cadillac finally revamping the larger cars in its lineup — perhaps the cars which were still looking mighty good to gray-haired buyers with lots of time on their hands. But when the 2016 CT6 hit the showrooms, many of these folks discovered that it wasn’t their grandfather’s Sedan deVille. While no one will mistake it for the screaming 464-hp ATS-V, nonetheless the CT6 was designed to be more of a driver’s car than any of the older big Cadillacs which came before. It’s about the size of a short-wheelbase BMW 7 Series sedan, but weighs about the same as Caddy’s own, smaller CTS. With a 2.0L I-4 turbocharged engine residing under the hood of the CT6 in standard form, connected to an eight-speed automatic transmission, the base price is $54,490. I decided to go online and build my own CT6 with a 3.0L twin turbo V-6, which starts at $65,390 (shying away from the Platinum Trim model which carries a hefty $88,640 starting price!). I was pretty disappointed with the color choices, both paint and interior. Except for the extra-cost Red Passion tintcoat ($995) I can only describe the color palette as drab. I chose the 20” Ultra-Bright Machined Aluminum Multi-Spoke wheels with — get this — Manoogian Silver Pockets, just so I could type-in Manoogian ($0 — but you need a $3,300 chassis upgrade to get them). Greedy I got, and ended up with an MSRP of $71,710. Things add up quickly! Read about all of the features of Cadillac’s latest European fighter, and maybe build your own right here. ### The post CADILLAC’S CT6 — TOP OF THE LINE appeared first on Buffalo Cars.